At 4 p.m., July 13, 2006, the sisterhood establishment ceremony was held on the 3rd floor of the Sejong General Hospital annex in Bucheon city. Zahng Gil-jah the Chairwoman of the New Life Welfare Foundation, Lee Kang-min the Chief Director of the Foundation, Park Yeong-gwan the Chief Director of the Sejong General Hospital, Noh Yeong-mu the Head of Sejong Medical Research Center and 20 people involved from both parties participated in the ceremony. Both parties greeted each other and signed the sisterhood relationship agreement. 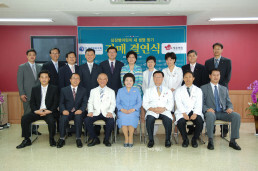 From now on, the New Life Welfare Foundation and the Sejong General Hospital will co-operate with operation and treatment fees, through which they will be able to reduce unnecessary cost occurring under the procedure of treatment and more children with heart disease will benefit from better medical environments. As a prominent hospital specializing in heart disease, the Sejong General Hospital has performed 1,300 heart operations during last year alone, and the success ratio of operation is domestically one of the best. Until now, over 40 children with heart disease in Korea and abroad, who were supported by the New Life Welfare Foundation, received operations and regained their health in Sejong General Hospital. Chairwoman Zahng Gil-jah expressed her thanks and joy for working together with the Sejong Hospital staff who rank number one for saving lives, in terms of the operation success ratio of heart disease. She clearly stated that this sisterhood relationship was established to give children the light of life, and she wished more children with heart disease could receive financial aid from the her welfare foundation and high quality medical help from the Sejong Hospital so that bright smiles may bloom on their faces. Chief Director of Sejong General Hospital Park Yeong-gwan valued the relationship with the New Life Welfare Foundation in saving lives until now, and said, “I’m greatly honored to establish a sisterhood relationship with the New Life Welfare Foundation that has shown a deep concern for our neighbors suffering from disease and has unsparingly supported the movement to make a country without heart disease.” He also said, “I believe we will be able to deliver love and hope to more neighbors,” and made a resolution that he would do his best until all the patients suffering from cardiac and vascular diseases smile brightly. The staff from the Sejong Hospital mentioned that they realized the importance of their own family as well as life itself through their life-saving works. This is also the mind of the New Life Welfare Foundation members, who value family and take the lead in saving lives and loving neighbors with gratitude.